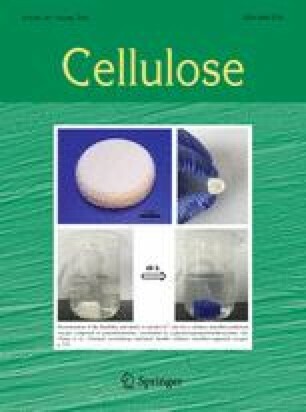 Cellulase activity on insoluble cellulose substrates declines as the substrate is modified. The role of structural changes that result in substrate recalcitrance, such as changes to cellulose crystallinity, requires further investigation. Crystallinity of cellulose samples with varying extents of digestion can only be compared meaningfully using a high throughput - Fourier transform infrared spectroscopy (HTS-FTIR) technique when the many variables involved are carefully controlled. Hence, changes to the HTS-FTIR sample preparation methods previously described in literature were necessary in order to obtain clean raw spectra and reliable measures of cellulose crystallinity. The sample preparation methods of residual cellulose after digestion by individual cellulases and a complex cellulase mixture from T. fusca were improved to remove extraneous overlapping signals, provide accurate extent of digestion, and correct errors caused by varying concentrations. These improved preparation methods enabled measurement of crystallinity index values of residual cellulose which did not show a correlation between cellulose crystallinity and the decline in cellulase activity. First and second author contributed equally to this work. This work is dedicated to the memory of Prof. David Wilson. The online version of this article ( https://doi.org/10.1007/s10570-017-1542-0) contains supplementary material, which is available to authorized users. The authors thank Prof. Larry Walker from Cornell University. Work was funded by a grant from the US Department of Energy BioEnergy Science Center (BESC). The research was supported by a fellowship from Obra Social “La Caixa”.